Aside from serving the very basic purpose of opening and closing for you, a new garage door can offer you other things. Its qualities will vary depending on various factors, such as the material its made of, its size and how insulting it is. Of course, the part of the door that allows it to operate automatically is the opener, which is essentially both a motor and a mainframe. This unit can offer you a lot of different features that can enhance the security and safety of your home, as well as add a great deal of convenience to your daily routine. However, for this blog post, we will focus mainly on the door itself and what you need to consider before getting a new one. Steel is usually the most popular choice and for a good reason. It is strong and highly resistant to weather damage. However, steel garage doors can suffer from rust if they aren't treated for it on a regular basis. What's more, they also tend to be quite heavy and will require a more powerful opener. Not to worry, though. There are more “modern” materials that can compete. Vinyl is also quite strong and requires barely any maintenance. Aluminum is lightweight, which means it won't need a powerful opener, but it will dent very easily, and won't provide you with a lot of security. If you want to greatly increase the curb appeal of your home, then a wooden garage door is going to offer you a lot. This material makes a door look utterly beautiful and the really great part is that you can have a custom-made model based on your very own unique design. The downsides of wood are the high amount of maintenance it requires and its heavy weight. The structure of the overhead door determines its thickness, its strength, and its R-value. The various structures can work with different types of insulation. This is important to keep in mind since the structural variety will determine how heavy your door will be. The most basic structure involves a single layer of steel. It’s obviously lighter and has a lower R-value. In a two-layer structure, rigid polystyrene insulation is added to the first layer. It typically has vinyl backing to protect it from damage. The panels are naturally much thicker than in the first case. The three-layer structure has insulation trapped between two layers of steel. In this case, you can choose between polyurethane and polystyrene insulation. 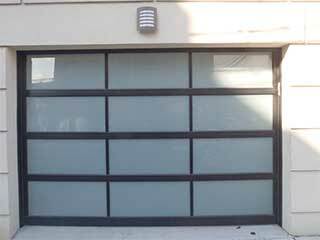 There are manufacturers that offer four and five-layer doors. Layers four and five, however, are decorative. For instance, you can have a composite overlay which mimics natural wood. Modern overhead doors come with either polystyrene or polyurethane insulation. Polystyrene is lighter and more versatile (it works with more structural options). Polyurethane, on the other hand, has a higher R-value per square inch and is more resistant to water damage and to mold. We know that all this information may get overwhelming rather quickly, which is why we invite you to simply call our experts at Garage Door Repair Tacoma and we'll help you make an informed decision.